So many delicous choices…what’s your favorite dog topping? The Chicago Dog…let me just tell you…there was a native Chicagoan sitting at the table next to me, and he told me that this dog is the best rendition of his hometown’s specialty that he’s found outside of Chicago. And after finishing this beauty, I could completely understand why. For you heat lovers, there’s a hot sauce with your name on it somewhere on this shelf. 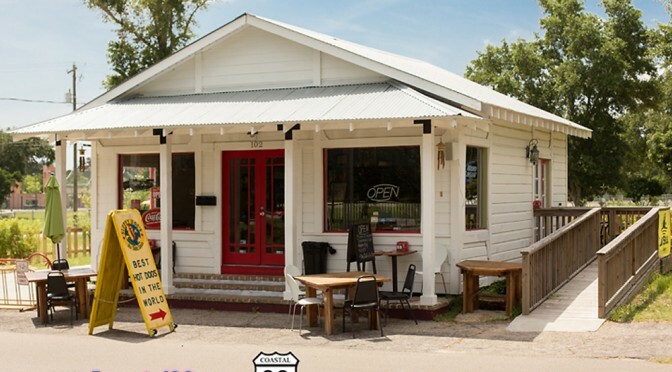 You really can’t go wrong with this amazing little shop…there’s something for everyone, and you can even take a walk across the street after your meal and feed the ducks at the duck pond, take a tour of the old Train Depot, or just enjoy the afternoon on their front porch. Definitely a must-see/eat in Bay St. Louis. Previous PostCypress Cafe in Bay St. LouisNext PostWhen will the fishing pier open in Waveland?